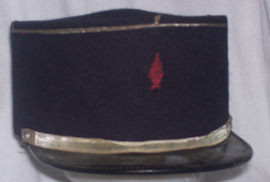 Guard Dress Helmet Worn 1880-1901, dark blue wool over cork, with a polished cotton lining. Has gilt spike and base, side buttons and N.Y. "Excelsior" front plate with regimental number. Ridabock & Co. label inside crown. 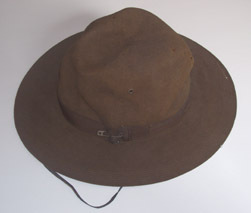 Also has the New York National Guard inspection stamp, when it was turned in for the new style dress hat. Excellent condition, no mothing. 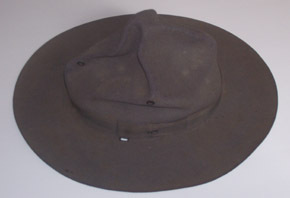 -001 World War I Imperial German Mutze Cap Pre-1897, Engineer of Fortress Troops, Enlistedman. Blue wool with black velvet sideband with blue piping. 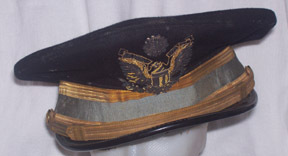 Leather sweat band. Made by "Max Kessel, Konigsee." With cockade on velvet sideband. We are reducing our inventory by 90% over the next few years. If interested in buying in quantity, Please call.